PALMDALE – Palmdale School District officials grossly misstated the district’s financial status and used an artificial multimillion dollar deficit to force salary cuts, furlough days, and benefits caps on its teachers and classified employees, according to claims made by Nancy Smith, a former district superintendent now running for Palmdale School Board in the Nov. 5 election. “They told the teachers they were over $15 million in deficit in February, and then by September they were 15 and a half million to the good… it was a $31 million turnaround and that should never have happened,” Smith said. Speaking at a packed community forum Wednesday, Smith said PSD officials misrepresented the budget to their advantage. Smith made the claims as featured speaker at a standing room only community forum at the Palmdale Hotel Wednesday evening. 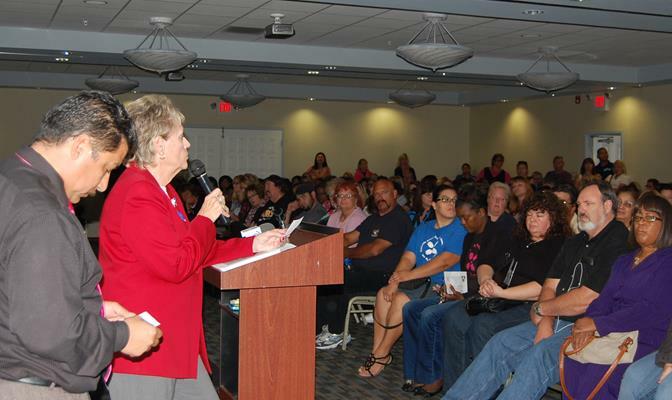 Hosted by the Palmdale Elementary Teachers Association and California School Employees Association Local Chapter 296, the forum was billed as a budget review to “debunk current school district financial claims and demonstrate recent cuts unilaterally imposed on staff are unjust and unnecessary,” according to a joint press release by PETA and CSEA. According to Smith’s presentation, during the past fiscal year alone, District officials overestimated the budget by millions of dollars in several areas, including certificated and classified salaries, fringe benefits, and books and supplies. This ultimately resulted in a false estimated deficit that fluctuated from $13 million in January, up to $15 million in February, and then down to $7.7 million in March, Smith claimed. Operating under such a scenario, the District imposed salary cuts, furlough days and a cap in benefits for teachers and classified employees. However, by September, the District’s Final Unaudited Actuals were a positive $15,513,061, Smith claimed. 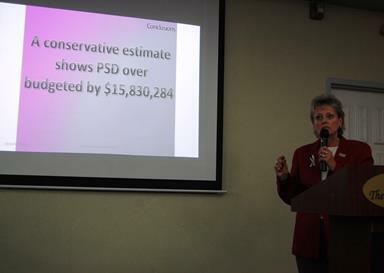 A conservative estimate shows PSD over budgeted by more than $15.5 million, Smith claimed. “There’s no reasonable explanation for what happened,” Smith said. As she detailed the numbers, several audible gasps could be heard from the audience. After the meeting, many teachers expressed shock and outrage. “People go to jail for stealing from Walmart, surely for stealing from the kids and the teachers in the school district somebody has to be held responsible,” said Mesquite Elementary teacher Annette Harris. “You can’t comb through your own budget, but you can deny me some 99-cent finger grips to protect my fingers? That is shameful!” said Barrel Springs Elementary teacher Romona Harvey, adding that she would like to see health benefits restored for teachers. The audience stood up and applauded at the end of the budget presentation. Most troubling was the fact that the classified union’s bargaining team had been trying to tell the District that the money was there all along, said Astrid Cante, a bilingual administrator for early childhood education. PETA president Hugo Estrada said that teachers would like to see more transparency from the school board going forward. Palmdale School District Interim Superintendent Pauline Winbush attended the forum Wednesday evening, but said she could not comment on the numbers just yet. “This is all new information that they’re presenting, so I don’t want to respond until I’ve had an opportunity to really look at the information,” Winbush said. In a press release issued earlier that day, Winbush announced the District would be restoring 11.2% of the salary reductions for the 2014-2015 school year. “We are able to make the restoration by utilizing a combination of the unrestricted ending fund balance (including the 1% “board reserve” as noted on the Unaudited Actuals), Excess Costs reimbursements received from neighboring districts in 2013 – 2014 and the sale of Pueblo Learning Center… We will continue to monitor “new, unrestricted” money that the district receives and apply it to the contingency language until we are able to restore the final 1% salary reduction and 9 furlough days for the 2014-2015 school year,” Winbush stated in the press release. Palmdale School Board President Sandy Corrales also said she planned to respond to the budget claims. We will update this story with her response as soon as it is available. View a point-by-point response from the school district on all of Smith’s allegations here. 31 comments for "Unions, former superintendent claim budget mismanagement in Palmdale School District"
Pete, im a classified employee who work for PSD. I make less money than you, I pay for my benefits, and I work annoy the same days as you do. Then the district decided to take away another 11% of my single income lively hood. Am I whining no, im pissed. When asked questions about the final numbers, we are given false information on why we are in a deficit. But still we see the administration getting trips to conferences, extra stipends, extended vacations, raises. My fellow classified employees, have not had a raise in over 5 years, but instead a steady cut of their income every year for the last 4. So Pete, how would you feel if your boss kept playing with your livelihood every year, but still keep there benefited packages with a increase yearly. How would you feel if you have to receive foreclosure notices yearly, or phone calls that threaten taking away your car. This is what the classified employees have been going through. We’re asking for fairness, from board members who care about the school employees and students. These board members are only concerned about receiving there financial gain, through benefits and perks, that the CBO and Gallizzi have been allowing to ruin through PSD budget, while giving themselves peeks as well. 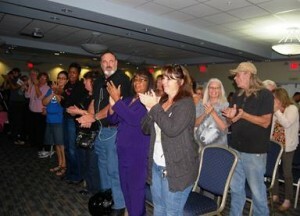 @Classified Employee….if I’m not mistaken you have not received a pay raise in 7-10 years, just cuts. How bout one of you financial wizards from PSD, or a board member jump on here and answer or confirm that for the interested parties…will most likely be a denial!?! The last pay raise was 1% given in Jan 2007. Corrales posted on her facebook that “the local chapter opted differently from the county endorsement” regarding classified emoyees. What she should have said was Chapter 296, which is the CSEA Classified employees of PSD did not endorse her.C’mon Corrales cut the bull s@#! you have lost the respect of both classified & certificated! Game over! TW Channel 3 interviewed Ms. Winbush today on the local news. If she follows Mr. Gallizzi’s footsteps nothing will change in PSD. This will be the only time to make things right with the Palmdale Community. Ms. Winbush the ball is in your court…hope you can handle the pressure. The odds on this one might be a bet I don’t take! Good luck all! They needed the teachers behind prop 30 to get us to vote ourselves a tax increase. Don’t blame the district, they were just following marching orders from the State. Everyone knows a teacher, cop, or fireman. Make them think their jobs are on the line, and Viola! Picket signs and demonstrations pushing people into thinking a self-imposed tax increase is a good idea. It’s for the children. I am identified in a picture with Mrs. Smith and Mr. Estrada. Sorry, I was in attendance, but that is not a picture of me. If I am not mistaken, that is Regina Riley. Hope that I have spelled her name correctly. I would like to say that I was misquoted. I explained that nearly 500 members held lay-off notices (some due to head start cuts) in their hands, and it forced them to think that a pay cut and furlough days were better than a lay-off. The best and final offer the district proposed, placed our members between a rock and a hard place; and yes, it was unnecessary to place so many people in such a high state of stress. Can we call for a re-vote based on being given false information?????? Of course the District will “justify” their budget. The facts are clear. PSD will fight tooth and nail claiming they are right. I wish I could figure out what their endgame is. It seems the goal is to anger all of their of their employee groups. Can you imagine if you ran your household finances in this way, one month a year I could find nearly 20% of my salary. That would be great. Remember to vote on November 5th. And what is your “end game” Mr. Michels? Are you an accountant? A specialist in school finance? Do you now or have you ever managed a budget bigger than your household? What do you and those like you have to gain? Are you one of the whiny teachers that don’t want to pitch in for your benefits. If you are let me remind you of something you and your peers seem to forget. You work an average of 180 days a year. In that time you make an average of $70000 paid for by my taxes. That means you make over $300 a day in wages. About $60 an hour to teach. And that’s before you factor in the generous benefit package we taxpayers pay for. Last I heard it was about $16000 a year. That makes your “average” compensation $86000 a year for just 180 days of work. I work around 300 days a year for about $52000. I pay for my families benefits package, as do most people in the real world. That means I work 120 days more than you for more than $30000 less. And on top of that I and my fellow tax payers pay your salary. How dare you complain!! How dare you expect more?! I am outraged! And guess what? There are a lot of taxpayers just like me that don’t buy your crap anymore. If you don’t like your job, or we pay you too little for your liking, come swap with me and the millions of other workers like me. Ingrate. Pete, where exactly are you getting your information from? I make far less than the average you speak of and in fact your statement is almost verbatim for an argument made in another comment section by a man named Devonte. Your claims are inaccurate and demonstrate a lack of understanding of what our jobs truly entail; do the job before you speak about compensation for hours worked. The “end game” of Mr. Michels, I can only infer, is to have the truth laid out by both sides. I only know of Mr. Michels based on limited interactions through professional development trainings and the few times he has spoken at board meetings. Based upon those experiences I have formed the opinion that he is direct, respectful, and merely wants all parties involved to work together and make compromises based on factual information. What is your “end game” when you make the erroneous statements you make? You do not appear to have any interest in the facts, just in disseminating faulty and judgmental rhetoric to the public. In addition, the taxes teachers pay to the state and federal government are the same taxes you and the rest of the public pay. Our tax dollars equally go to all of the same entities as yours, so don’t pull a “we, the taxpayers” argument while ignoring the fact that teachers and classified staff are taxpayers as well. Did you go to college? Have a degree in education? However, I’ll waste my time nonetheless…. If you HONESTLY believe that teachers only put in 5 hours of work per day (your math:”….$300/day in wages…. $60 an hour to each”).. then you have other, MORE SERIOUS problems in your life. Considering I’m surrounded by teachers in my family (including my wife), I am over-qualified to make statements with regard to how many hours of work teachers put in OUTSIDE of the classroom each and every day/week. Sorry, but somebody had to call it like we see it. Seriously Mr. Malechikos? You don’t expect anyone to believe you just because you wrote it in ALL CAPS? Didn’t your union just issue a notice to all employees to comply with only the hours of their school? Do you have any idea how many teachers I see bolt to their cars as soon as the bell rings? Half the time my daughter’s teacher beat her to the parking lot. I don’t have more serious problems, but you seem to have some issues with reality…or perhaps the truth. You did not read what Mr. Malechikos wrote at all and based your response on faulty assumptions based on your observations, not the actual situation. Though I am sure he does not need my help in defending his statement , as an actual teacher in the Palmdale School District, I would like to clarify some of your (and other members on this forum) misconceptions. To begin with, Mr. Malechikos never stated that he was a teacher. In fact, he stated that his wife and others he is in contact with are teachers. Secondly, Mr. Malechikos never stated he or his wife or their friends and family were employed by PSD; therefore your statement regarding “his union” is completely unfounded. As a member if PETA I can tell you yes, we were asked to only work our contractually stipulated hours; our day begins, per our contract, 10 minutes before the first bell rings and ends as soon as the bell rings at the end of the day. It was each individual’s choice whether or not to participate in the five days of “work to rule” to show the public what life would be like if teachers, and classified, did not work the time that we typically do. The fact that your daughter’s teacher was out in the parking lot is no indication as to the quality or worth of the professional. Thirdly, what is the problem with a teacher leaving at the end of his or her contractual work day? Of those teachers, how many do you see rolling carts or carrying bags laden with papers to correct at home? Do you see them arrive sometimes up to two hours before the school day begins to plan and grade, or see them work through their lunch and prep periods (should they be so lucky as to have them)? Many of us are parents and take our children to appointments and activities, just like you. In your opinion, is it expected that employees in other fields stay over their scheduled on work “off the clock”? So why, then, do you take issue with teachers when we do the same? Again, how do you know what time we do or do not spend outside the confines of the school campus doing our jobs? In fact, upon completing this post, I am putting my daughter to bed and then I am on my way to sit down and grade work for the next two hours before I go to bed myself. This response to your statements is by no means meant to be unkind or question your grasp of reality. Your opinion is based on your perception of the situation; I only hope to address your misconceptions based on true life, personal experiences…my own as a teacher, and those of a child of two teachers. Great job PETA & CSEA!! You stood your ground and I applaud you!! How does one vote to impose in early July (giving two furlough days to the teachers before school starts) and then find money during the first week of school in early August? Who would want to keep these people on the board? Typical pre-election rhetoric. Nancy Smith was an awful superintendent and I refuse to vote for her knowing her history; or any PETA candidate. Hugo should be ashamed of himself for supporting her. Teacher’s clearly have forgotten her PSD tenure. The issue here is the mismanagement of money during the last six years. It’s not about what might or might not of happened fifteen years ago. I am a past PETA President during Nancy’s tenure and I am grateful that Nancy Smith has stepped into this arena and exposed herself to criticism from the people that support Roger and Sandy. All Palmdale School District Employees as well as the public, have been misled regarding the budget and Nancy is one of the few people with the knowledge and ability in this valley to expose their corrupt ways. Thank you Nancy! My thoughts exactly, Ken! Thank you Nancy. We should be grateful that someone has finally stepped up to enlighten the employees and community about the true state of affairs. There can be no denying that it is mismanagement at the least, if not something more cynical! It’s time to go to the next step and put an end to this mess. Perhaps those involved in this deception will come forward or step down-it’s okay to repent, say I’m sorry or I lied – the time is now as this cannot continue! My prayer is that restoration will come to the PSD – trust, ethics, morale, priorities, finances, and the ability to once again work as a team to give our students the best education possible. Thank you, Mrs. Smith! Tom H – You might want to check your sources. Ms. Thacker was never part of the “fiscal management team”. She was the Director of Transportation prior to her retirement from the district. Sorry “Tom H.” or whatever your real name is. You either got your information all wrong or you are an incumbent spreading more lies and innuendo!